In What Ways are External and Internal Links Different? SEO is a wide field and every day we can find something different, some updates in the field. We all know that learning is a never ending process and hence the deeper we go in this field, the more knowledge we can gain. Knowledge helps to identify what’s correct and what’s not. There are various SEO firms in the market who just take you into their sweet words but when it comes the time for result, they don’t have proper answers. In order to stay away from such fraudsters and to choose the right one that can lead you towards the path of success, it is necessary to have proper knowledge of the field. So, keeping this thing in mind; we decided to start sharing knowledge about every small part of Search Engine Optimization. To frame a perfect SEO strategy, it is necessary to know about the exact difference between external and internal links. External Links: These links begin from one domain to a completely separate domain. These links can be from one website to another, from your site to the other or vice-versa. Generally, external links are used to provide more information to the visitors. These can be from third party websites as well. Internal Links: Such links can only be visible within your website or domain and are used inside the website to promote one’s own business. Some of the examples of such links include Menu bar having internal links to other web pages such as Contact Us, Blog, Services and more. In a nutshell, we can say that external links are those that will help you to develop your business whereas internal links include content from the same domain. How to use both links in an appropriate manner? a) Boost Visibility: External links are useful in enhancing visibility and such links from other websites prove to be a great traffic source. Google’s search engine algorithm always considers the quality as well as quantity of links. External links from poor quality websites can lead to a negative impact. In order to have qualitative links, it is necessary to add content that is relevant to your site. Make most use of guest posts. Apart from this, there are various ways to encourage inbound links as well as external links to your site by adding infographics that contain links which can be copied and used on other sites. b) External Links are more useful to readers: Readers get highly benefitted from links that point to another website however these have very low strategic SEO value. These links can connect to readers to various resources including products and/or information that is of utmost value to you. Website on which users are redirected are benefitted the most as compared to the benefit gained by your site. Internal links are used to develop SEO of your website. These provide various SEO benefits. Such links are easily followed by the search engine spiders to identify additional pages on the site. Search engines take too much time to find unlinked pages. On daily basis, thousands of new web pages are added daily and here web spiders are quite busy. Internal links also form the website structure. 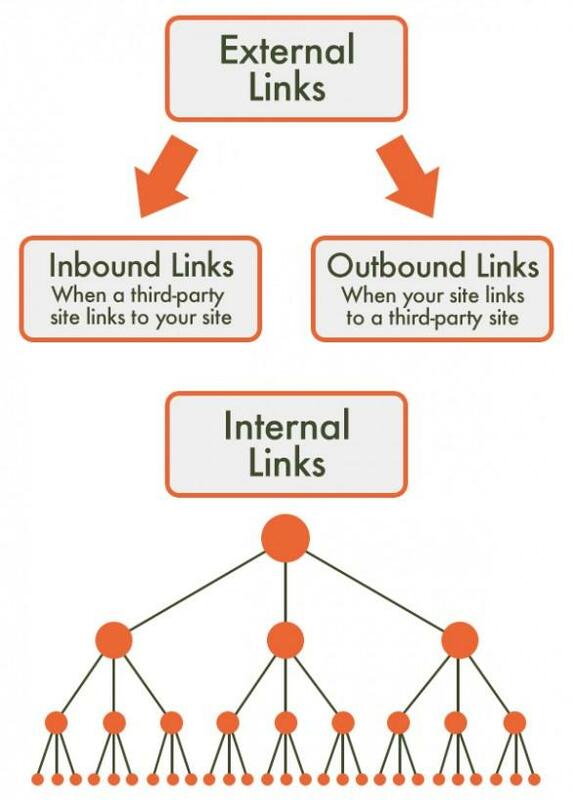 Relevant linking structure is visually appealing and effective. It is useful in framing the content in a proper manner so that visitors can identify the information quickly. Natural Page links available in your entire site can help readers as well as search engines to find your content. Broken links can badly hamper your SEO score. Such links are those that don’t give desired results which means the page to which they are redirected is either unavailable or is shifted to another web address. Having ample of broken links in your site can easily hamper your back links. These make a bad impact on search traffic and also lead to poor reading experience as well as decreased traffic. Fixing them as quickly as possible will help you to improve the website. There are various tools available on the internet used to find broken links so that once found; these can be either fixed or removed. Conclusion: Links are just a part of SEO. There are various other elements that play an important role in Google’s algorithm. Internal and external links are but a small part of this huge sea called SEO. It takes time to develop links and fix those that are broken but these efforts play an important role in the long run by offering boost in traffic and position in the SERPs. This makes all the efforts worthy. So, now whenever you wish to try link building for your website’s SEO then feel free to get in touch with one of the well known Melbourne SEO Services provider, Platinum SEO.